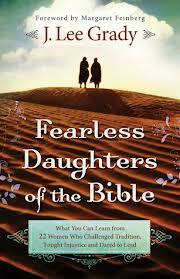 Fearless Daughters of the Bible edifies Christian woman to boldness in the Lord through biblical stories integrated with examples from history and personal commentary. Each chapter focuses on a woman from the Bible who had courage in a particular area; for instance: “The Five Daughters of Zelophehad: The Courage to Challenge Tradition,” “Hannah, the Mother of Samuel: The Courage to Believe God,” or “Priscilla, Spiritual Daughter of the Apostle Paul: The Courage to Mentor Others.” The chapters cover a great variety of women and circumstances–some widely known, like Mary, the mother of Jesus, and some lesser known, like Achsah, Daughter of Caleb. There are also questions and a personal message at the end of each chapter, making this an ideal book for an independent or group devotional study. My favorite chapter was on the Samaritan woman whom Jesus met at the well. I have heard commentary on this story so many times, and yet Grady shared details of the event that I had never considered. I had never realized, for instance, that the well was on the same land where Dinah was raped. I have been learning lately about the deep importance (and spiritual ramifications) of location; so, these details about the land of Samaria added so much to the otherwise familiar account. It also caught my attention that, unless her encounter with Jesus had caused a very visible and distinctive change, this women–who had experienced so much rejection–would never have been believed by so many in her city. And yet, the scriptures show the woman at the well as a successful evangelist, bringing salvation to many by sharing her encounter with the Lord (John 4:39-42). As cliche as it may be to say: every Christian woman could benefit from this book! It is encouraging, insightful, and lovingly written by a man who greatly desires to edify women in their personal callings. For more information about the author, check out his ministry: The Mordecai Project.